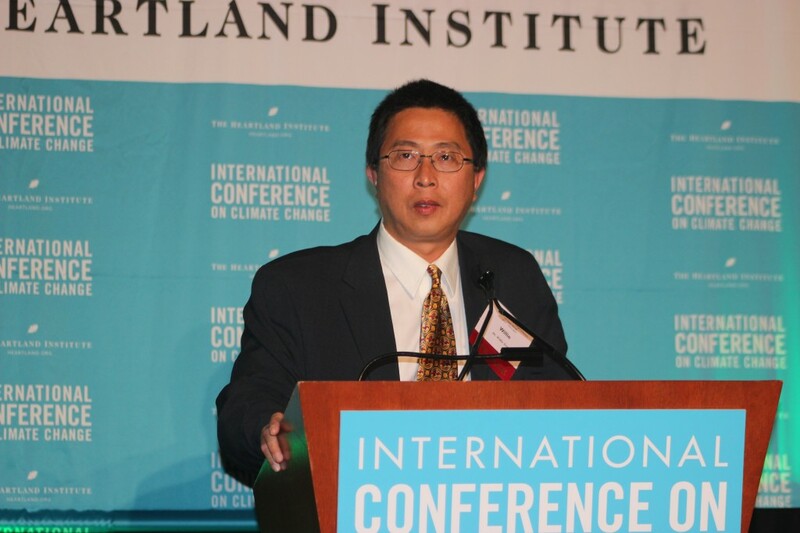 Dr. Willie Soon, an astrophysicist and geoscientist, is a leading authority on the relationship between solar phenomena and global climate. His discoveries challenge computer modelers and advocates who consistently underestimate solar influences on cloud formation, ocean currents, and wind that cause climate to change. Since 1992, Dr. Soon has been an astronomer at the Mount Wilson Observatory. He is also receiving editor in the area of solar and stellar physics for New Astronomy. He writes and lectures both professionally and publicly on important issues related to the sun, other stars, and the Earth, as well as general science topics in astronomy and physics. Dr. Soon’s honors include a 1989 IEEE Nuclear and Plasma Sciences Society Graduate Scholastic Award and a Rockwell Dennis Hunt Scholastic Award from the University of Southern California for Athe most representative Ph.D. research thesis” of 1991. In 2003, he was invited to testify to the U.S. Senate. Also in 2003, Dr. Soon was recognized, with a monetary award, for Adetailed scholarship on biogeological and climatic change over the past 1,000 years” by the Smithsonian Institution. In 2004, Dr. Soon received the Petr Beckmann award of the Doctors for Disaster Preparedness for Acourage and achievement in defense of scientific truth and freedom.” In 2014, Dr. 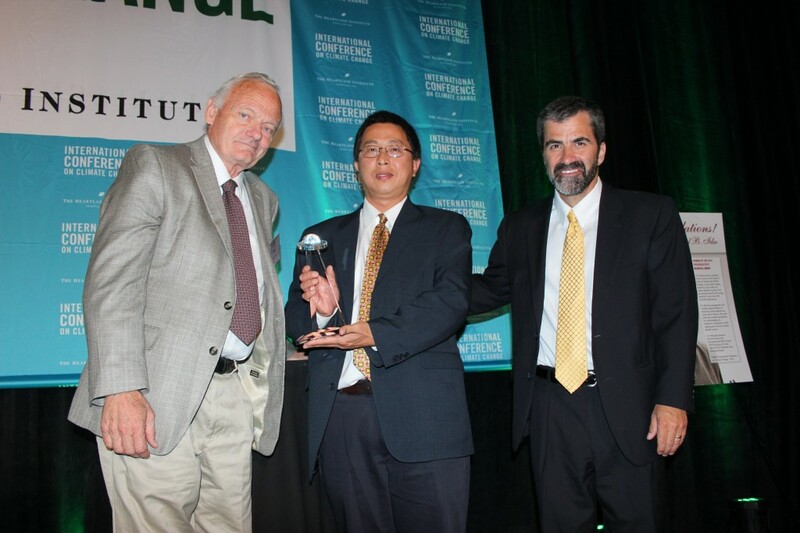 Soon received the Courage in Defense of Science Award, with a monetary award, from the George C. Marshall Institute. 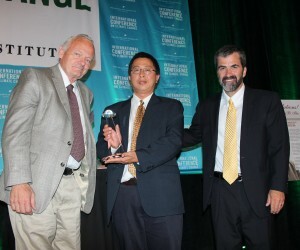 The award was presented at the Ninth International Conference on Climate Change held in Las Vegas. Dr. Soon is the author of The Maunder Minimum and the Variable Sun-Earth Connection(World Scientific Publishing Company, 2004). 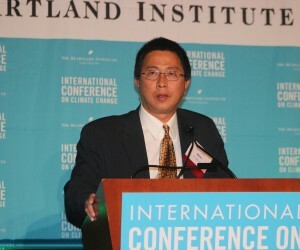 He is the coauthor, with Sebastian Lüning, of Chapter 2: “Solar Forcing of Climate,” in Climate Change Reconsidered II: Physical Science (The Heartland Institute, 2013), a comprehensive critique of the Working Group I contribution to the Fifth Assessment Report of the Intergovernmental Panel on Climate Change. Congratulations. I’m thrilled for your success and only somewhat disappointed that you didn’t win Handsomest Climate Skeptic of 2014. I have met Dr. Soon through the Air & Waste Management Association annual meeting and Mr. Dennis Mitchell. Dr. Soon is a respected voice for science. He needs to be heard by more people. It has been my great privilege to share a public podium with you on several memorable occasions. From that perspective I observe that it is not simply that you are courageous under fire, as you indeed are, but also the wonderful combination of politeness, feistiness, good humour, and accurate knowledge that you invariably manage to project – no matter what the circumstances or provocation. Thank you for your unflagging personal commitment to high calibre research and to honest public outreach of the results, and my warm congratulations on your richly deserved award. Congratulations Dr. Soon for giving alarmists the Willies. I know of no one who more deeply reflects the cause of sound, honest, transparent science in the service of mankind, and no one who has shown greater courage in the face of withering criticism and appalling treatment at the hands of fellow scientists and academicians. Congratulations on an award that you have truly earned – on the battlefields of intolerant climate alarmism and rent-seeking. My best regards – and looking forward to seeing you in Las Vegas. The George C. Marshall Institute was established in 1984 as a nonprofit 501(c)(3) corporation to conduct technical assessments of scientific issues with an impact on public policy. The Marshall Institute publish reports, host roundtables, workshops and collaborate with institutions that share the same interest in basing public policy on scientific facts. Dr. Soon earned his bachelor's and master's degrees in science and his Ph.D. in aerospace engineering from the University of Southern California. Soon, W.H. E.S. Posmentier, and S. L. Baliunas, 1996: Inference of solar irradiance variability from terrestrial temperature changes, 1880–1993: An astrophysical application of the sun‑climate connection, Astrophysical J. 472: 891–902. Baliunas, S., P. Frick, D. Sokoloff, and W. Soon (alphabetical listing with W. Soon as lead author), 1997: Timescales and trends in the Central England Temperature Data (1659‑1990): A Wavelet Analysis, Geophysical Research Letters 24: 1351–1354. Posmentier, E.S., W.H. Soon, and S.L. Baliunas (equal contribution by Posmentier and Soon), 2000: Natural variability in an-ocean-atmosphere climate model, Journal of Physics Malaysia19: 157. Soon, W.H. S.L. Baliunas, E.S. Posmentier, and P.N. Okeke, 2000: Variations of solar coronal hole area and terrestrial lower tropospheric air temperature from 1979 to Mid‑1998, New Astronomy 4: 563–579. Soon, W.H., E.S. Posmentier, and S.L. Baliunas, 2000: Climate hypersensitivity to solar forcing? Annales Geophysicae, 18: 583–588. Soon, W., S. Baliunas, K.S. Demirchan, S.B. Idso, K. Ya. Kondratyev, and E.S. Posmentier, 2001: The impact of anthropogenic CO2 emission on climate: unresolved Problems (in Russian), Proceedings of the Russian Geographical Society 133 (1). Soon, W., S. Baliunas, S.B. Idso, K. Ya. Kondratyev, and E.S. Posmentier, 2001: Modeling climatic effects of anthropogenic CO2 emissions: Unknowns and un‑ certainties, Climate Research 18: 259–275. Soon, W., S. Baliunas, S.B. Idso, K. Ya. Kondratyev, and E.S. Posmentier, 2002: Reply to comments on AModeling climatic effects of anthropogenic CO2 emissions: unknowns and uncertainties” by James Risbey, Climate Research 22: 187–188. Soon, W. and S. Baliunas, Proxy climatic and environmental changes of the last 1000 Years, 2003: Climate Research 23: 89–110. Soon, W., S. Baliunas, S.B. Idso, K. Ya. Kondratyev, and E.S. Posmentier, 2003: Reply to comments on AModeling climatic effects of anthropogenic CO2 emissions: unknowns and uncertainties” by D.J. Karoly, J.F.B. Mitchell, M. Allen, G. Hegerl, J. Marengo, and F. Zwiers,Climate Research 24: 93–94. Soon, W. and S. Baliunas, Annual progress report on global warming: 2001–2002, 2003:Progress in Physical Geography 27: 448–455. Soon, W., S. Baliunas, C. Idso, S. Idso, and D.R. Legates, 2003: Reconstructing climatic and environmental changes of the past 1000 Years: a reappraisal, Energy & Environment 14: 233–296. Soon, W., S. Baliunas, and D.R. Legates, 2003: Comment on AOn past temperature and anomalous late‑20th Century warmth” by Mann et al., Eos 84 (44): 473. Soon, W., D.R. Legates, and S. Baliunas, 2004: Estimation and representation of long‑term (> 40 years) trends of northern-hemisphere-gridded surface temperature: a note of caution,Geophysical Research Letters 31: doi:10.1029/2003GL019141. Soon, W., 2005: Variable solar irradiance as a plausible agent for multidecadal variations in the Arctic-wide surface air temperature record of the past 130 years, Geophysical Research Letters32: doi.10.1029/2005GL023429. Dyck, M., W. Soon (as co-first authors), et al., 2007: Polar Bears of Western Hudson Bay and climate change: warming spring air temperatures as the `ultimate= survival control factor?Ecological Complexit, 4: 73–84. Soon, W., 2007: Implications of the secondary role of carbon dioxide and methane forcing in climate change: Past, present, and future, Physical Geography 28: 97–125. Armstrong, J.S., K.C. Green, and W. Soon, 2008: Polar bear population forecasts: A public-policy forecasting audit, Interfaces 38: 382–405 [plus 3 comments and authors’ reply]. Dyck, M., W. Soon, et al., 2008: Reply to response to Dyck et al. (2007) on polar bears and climate change in western Hudson Bay by Stirling et al. (2008), Ecological Complexity 5:289–302. Liu, J., B. Wang, Q. Ding, X. Kuang, W. Soon, and E. Zorita, 2009: Centennial variations of global monsoon precipitation in the last millennium: Results from ECHO‑G model, Journal of Climate 22: 2356–2370. Empirical evidence, mechanistic explanation, and testable consequences, Physical Geography30: 144–184. Green, K.C., J.S. Armstrong, and W. Soon, 2009: Validity of climate change forecasting for public policy decision making, International Journal of Forecasting 25: 826–832. Soon, W., 2009: Comments on HESS Opinion “A random walk on water” by D. Koutsoyiannis, Hydrology and Earth System Sciences Discussions 6: C2852–C2856. Soon, W. and D.R. Legates, 2010: Avoiding carbon myopia: Three considerations for policy makers concerning manmade carbon dioxide, Ecology Law Currents 37: 1–9. Armstrong, J.S., K.C. Green, and W. Soon, 2011: Research on forecasting for the manmade global warming alarm, Energy & Environment 22: 1091–1104. Agnihotri, R., K. Dutta, and W. Soon, 2011. Temporal derivative of total solar irradiance and anomalous Indian summer monsoon: an empirical evidence for a Sun-climate connection,Journal of Atmospheric and Solar-Terrestrial Physics 73: 1980–1987. Soon, W., K. Dutta, D.R. Legates, V. Velasco, and W. Zhang, 2011: Variation in surface air temperature of China during the 20th century, Journal of Atmospheric and Solar-Terrestrial Physics 73: 2331–2344. Legates, D.R. and W. Soon, 2011: Chapter 4: Sea level changes in Bangladesh: observational constraints on human, geologic and weather-climate variability related factors, in Climate Change‑ Issues and Perspectives for Bangladesh, Rafique Ahmed, and S. Dara Shamsuddin (Eds). Dhakar, Bangladesh. Legates, D.R., W. Soon, and W.M. Briggs, 2013: Learning and teaching climate science: The perils of consensus knowledge using agnotology, Science and Education 22: 2007–2017. Legates, D.R., W. Soon, W.M. Briggs, and C. Monckton of Brenchley, 2013: Climate consensus and ‘misinformation’: A rejoinder to ‘Agnotology, Scientific Consensus, and the Teaching and Learning of Climate Change,’ Science and Education (August). Soon, W. and D.R. Legates, 2013: Solar irradiance modulation of equator-to-pole (Arctic) temperature gradients: empirical evidence for climate variation on multi-decadal timescales,Journal of Atmospheric and Solar-Terrestrial Physics 93: 45–56.